Fleas can not only be a pest on your pets, but also a problem in your home. Fleas have four stages of development from egg to adult. Adult fleas represent just 5 percent of the actual flea population. There are fast acting chemicals available to treat fleas. Using things around your house will work as well, but they may take a little more time to totally kill off all of the fleas. Gather together any items within your home which are washable, such as sheets, pillows, throw rugs, pet bedding and blankets. Wash these items in your washing machine with laundry detergent and hot water. Wash your pets indoors with a pet shampoo and leave your pet shut in the bathroom while you mop any hardwood or vinyl floors and vacuum all carpets. If possible, also vacuum upholstered furniture and mattresses before letting your pets loose in the house again. Vacuum your floor daily for at least two weeks as new adult fleas hatch. 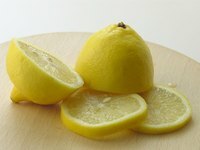 Chop up 6 to 8 lemons into slices or wedges and leave them in a quart of hot water to sit overnight. In the morning pour the liquid portion into a spray bottle and spray one application over carpets, upholstered furniture and on your pets’ bedding. Leave pieces of black walnut branches 6 to 8 inches long under furniture in your home where your pets and/or children can’t get to it. The odor of the black walnut should repel the fleas and cause them to leave. The branches can be discarded after a month. Treat your carpet every 3 to 4 days by sprinkling a mix of four parts borax powder and one part table salt. Let the powder sit on the carpet for an hour to help dehydrate the eggs before vacuuming it up. Treat your pets on the same day as you treat your home to avoid re-infestation of your home or pets. You can add one to two drops of tea tree or lavender oil to the bath water before washing your pets, however, if they have a tendency to lick excessively (creating "hot spots") or you know them to have sensitive skin this is not recommended.